This definitive history of Amway is an inspirational, motivational chronicle of the company as a whole--its ideology, goals, beliefs, ethics, and sense of values. With provocative insights into the first four decades of Amway, this valuable book shows where the company stands at the dawn of the new millennium--and how it will continue to move forward in the twenty-first century. In addition to the actual history of Amway, you'll read the stories of people around the world whose lives have been totally transformed by its philsophy. Each is an astonishing account of personal success that will motivate you to improve your own life by following the principles, standards, and marketing precepts created by the founders of Amway. Not just a business, but an opportunity for personal success and achievement, Amway has spread the old-fashioned American dream across the globe-from South America to the Pacific Rim. This definitive history of Amway delves deep into the heart and soul of the organization. It is an inspirational, motivational chronicle of the company as a whole-its ideology, goals, beliefs, ethics, and sense of values-filled with uplifting stories of people around the world whose lives have been totally transformed by the Amway philosophy. Wilbur Cross is the author of Choices with Clout (Berkley). He lives in Hilton Head, South Carolina. 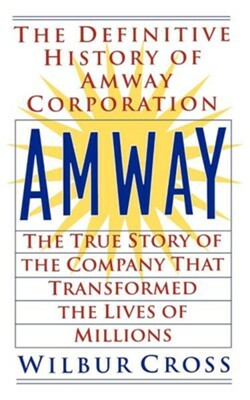 I'm the author/artist and I want to review Amway: The True Story Of The Company That Transformed The Lives Of Millions.